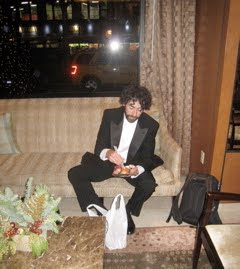 A mere several hours later at 5.20am, Alan greets the day with sushi to sustain him through our morning at NBC for TODAY. We were called to arrive just before 6am to tape for Christmas Eve, and rehearse for today's live performances. We travelled in our concert clothes, and warmed up in the bus.